Gangalur, Chhattisgarh: You can’t see it now, but somewhere in the concrete, there is a lot of blood. Twenty-seven policemen and villagers died in 166 Maoist guerrilla attacks while building a 23km road over two- and-a-half years. In the heart of Chhattisgarh’s remote Bijapur district, the road from Bijapur town to the rural hub of Gangalur is a monument to the invisible government in insurgency-affected India. The public works department (PWD), whose job it was to build the road, did not do it. In October 2007, the police force decided to. “This had become a question of prestige. The road had to be built by any means. We put 400 policemen on guard," said Ashok Singh, a police officer who was involved with providing security to the two-and-a-half-year operation in the area where there was no police station for an 80km stretch. 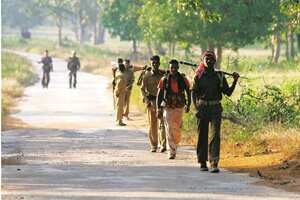 “They (Maoists) used to plant bombs at night. They killed workers. There were face-to-face ambushes every few days," said Singh. Maoists, who have influence in varying degrees in a quarter of India, oppose the building of roads in their strongholds, as police vehicles can then drive in. That is what happened on the Gangalur route: rebel influence eased with the building of the road in the area, once an impregnable Naxalite hub near the iron ore-rich Bailadila hills, criss-crossed by rivers and covered in dense forests. The road changed the lives of thousands of people in 30 villages. Villagers who had to walk up to 25km to get into Bijaur town could now take one of the public buses, which started plying last month. That is a rare story in a nation where officials tasked with development rarely go to work in insurgency hubs and leave large amounts of budgets unspent. “No other department works here. Even fixing potholes seems to be our responsibility," said another police officer. “Bridges, roads, hand pumps are all built on paper. The other departments are sleeping tight with sheets on their heads." In 2006-07, the last year for which such consolidated figures are available, around half of the Rs5,800 crore of development funds were just not used in 152 insurgency-affected districts. On the Chhattisgarh border with Andhra Pradesh, two villages on either side tell that story eloquently: Maraigudam in Andhra Pradesh has electricity, good roads, and public health centres. Two hundred metres away, Maraiguda, a Chhattisgarh village, has none of those. “I wanted to become a guruji (teacher). I didn’t have money to pay for the fees, I needed about Rs1,700," said Pankaj Andrik, 19, a class XII dropout in Cherla village. “But even if I did, there are no teachers in colleges. Six months ago, six teachers had been appointed. No one came." The assistant superintendent of police in the Bhairamgarh area has been suspended; he hasn’t joined work eight months after being posted. Ten months ago, 10 inspectors and eight sub-inspectors got their postings to this area cancelled. And when money is spent, there is little accountability. “This is like a black hole for government money. Bridges that have never been built, roads never built," a senior police officer said on condition of anonymity as he is not authorized to speak on the subject. “In the name of Naxalites, no work gets done and no one comes to check." In an effort to fix that, a new experiment is taking place next door in the Dantewada district: PWD has just been brought under control of the superintendent of police. Chief minister Raman Singh says everything will change, alongside the nationally coordinated offensive planned against the rebels. “We are going to push governance… A lot of people don’t want to go to work in those areas," Singh told the Hindustan Times in an interview at his home. “There is also fear and terror—but people in other departments, like agriculture, health, forest, they do carry out their functions." That might not hold true in the faraway areas where, for villagers trapped in the war zone, the challenges far bigger than the security situation are the impossible terrain, the joblessness and the crushing poverty. “Have you ever been on a train?" the region’s inspector-general asked a villager. “Have you ever had paneer ki sabzi (cottage cheese curry)?" “What tree does it grow on?" the villager asked.